If you’re like many women, the standard B-cup of most commercial patterns isn’t enough to, ah, cover your bits without unsightly pulls and wrinkles. But with the popularity of wrap tops and DVF-style wrap dresses, there are some small but significant pattern changes you need to make so your entire bodice fits well. Let’s have a look. The other day, I made Simplicity’s top, 4076. It has a great mock wrap with ruching at the side. In order to fit properly, you have to adjust for a full bust, not only on the actual bustline of each front pattern piece, but also on the wrap piece that extends under the bust on the other side. This is a fairly straightforward change, but it’s one that many people leave off, giving a happy-hands-at-home look to their garments. The first thing you need to do is your standard full-bust-adjustment, or FBA. There are many excellent tutorials for how to adjust a pattern out there. Sewing Diva Gigi has a great one on her blog. I won’t bother to repeat what has already been said so well. Repeat this whole process on the other side. 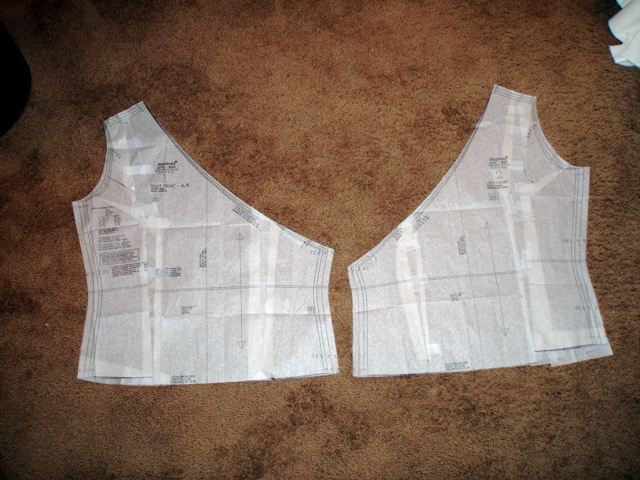 Once you are done, you will have two pattern pieces that have two sets of slashes for the bust, and your top will fit great! The finished result will be free of unsightly pulls and gaps, and will fall gracefully across the body. I used this method on my Simplicity wrap top with great results. Thanks Ann, for a great visual on this process. Handy, as I have one of these coming up when my vintage 1970’s DVF wrap pattern that I just bought on eBay coming any day now in the mail. Thanks, Ann. This is really helpful. It makes sense and also explains issues on a previous top. This tutorial is very helpful and one that I don’t remember seeing anywhere before. Thank you thank you! The tutorial is very helpful and clear. 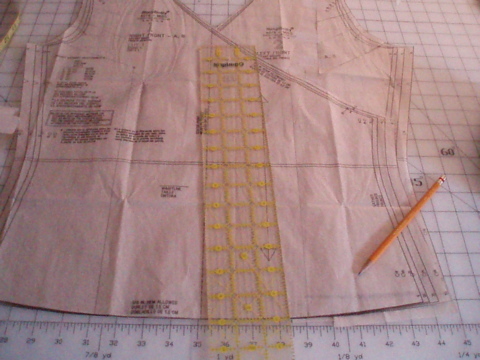 I personally won’t need it – I actually fit the patterns as drafted – but that doesn’t mean I don’t need the info. I never know when I’ll be asked to sew for someone who’d need this adjustment. Thanks! 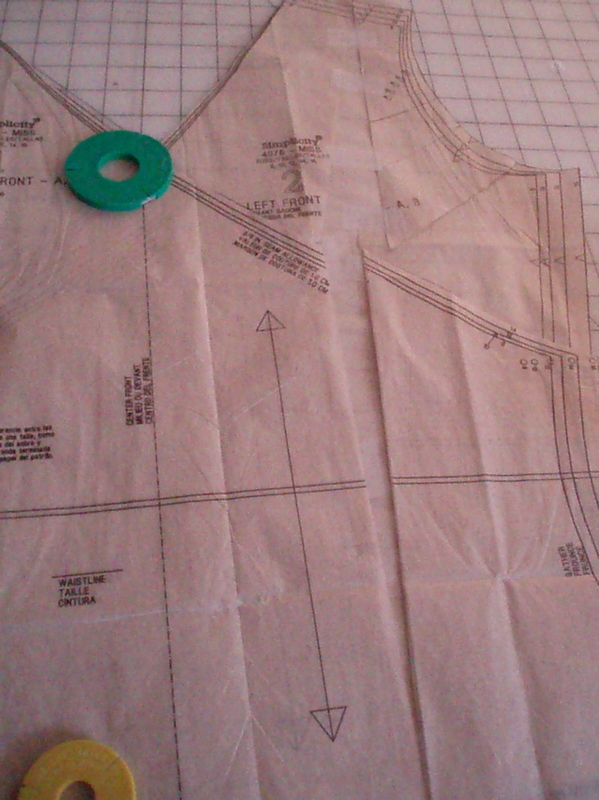 This pattern is sitting on my cutting board and I’ve been trying to figure out how to do the FBA properly. I tried to do an FBA on a wrap top a year or so ago and it was a disaster…. 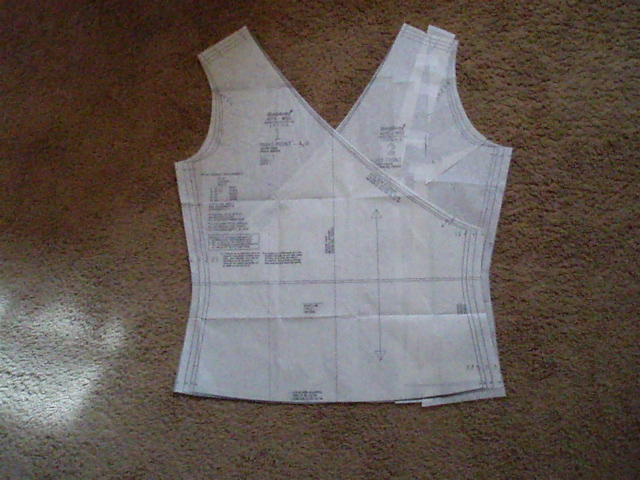 I also fit the garments as drafted but I find this tutorial very valuable. There’s always room for sewing knowledge and you explained this pattern alteration so well! Thank you! thanks for the tutorial some good information.. I have been wanting to make the simplicity pattern 4076. Very timely. I will be making a wrap dress with some of the fabric I bought from you! Ah ha. This explains why my last attempt at a similar top didn’t hang right. I’ve been avoiding wrap tops ever since! Now I know how to fix the pattern. Thanks! Ann, thanks for the tutorial. Helps me understand better my fitting problems with wrap tops. I do have a question about the basic FBA you showed, though, and I can’t find Gigi’s tutorial on it. My standard FBA on an undarted top adds a dart — giving me not only more shaping through the bust but also additional width (which yours does) and additional length (which yours doesn’t). Does the FBA you showed somehow add a rotated dart that I’m not seeing? And how does it keep the top from being too short in the front? I haven’t found a good way to adjust undarted knit top/dresses for my bust without adding a dart, and I’d be delighted to find a method. Hence the questions… I’d really like to better understand how this works. oooh! this is squeal inducing. I’ve just been reading up on this adjustment before I decide on a wrap pattern. THANKS! into a seam under the bust)would I use this method and make the front lower piece wider? That doesn’t seem right. Thanks, and I Look forward to the fabrics. I got beat out for one of the prints:( but will try again. This was most helpful. Thanks for the photos to go with the written instructions. Makes it so much easier to follow. This blog is so much easier to read now. Thank you for listening. I was floored just now because I had just finished tracing that Simplicity wrap top pattern in what I thought was my size. I did my usual adjustments for the back piece and now see that I will need to increase for the full bust…..what a bummer! I thought I was done! I also traced the style gathered at the neck pattern…same envelope…though in a larger size than I need to test the general fit. I will go back to that pattern adjustment in the morning because it is the sensible thing to do, while my mind is telling me to be lazy and ignore the changes. I am so glad that I looked in tonight, this has now saved me having a ‘disaster’ on my hands tomorrow. Thanks ever so much for posting this tutorial and for making the blog legible otherwise I wouldn’t be able to read any of it. Ann, thank you for posting this very informative tutorial! I’m trying to find the FBA instructions that are supposed to be on Sewing Diva Gigi’s blog, but the link must not work or I’m missing it. I need to adjust a top and want to try her tutorial. Can someone link me to it or tell me where it is? Thanks. Like Pam (11) and LVS (17), I am unable to find the recommended tutorial by Gigi on the FBA which is mentioned in the first step. I have found other tutorials but I am keen to read Gigi’s and would be grateful if someone would post a link. Thank you. Now I “get it”. One of my duh moments. So simple when you actually see it. 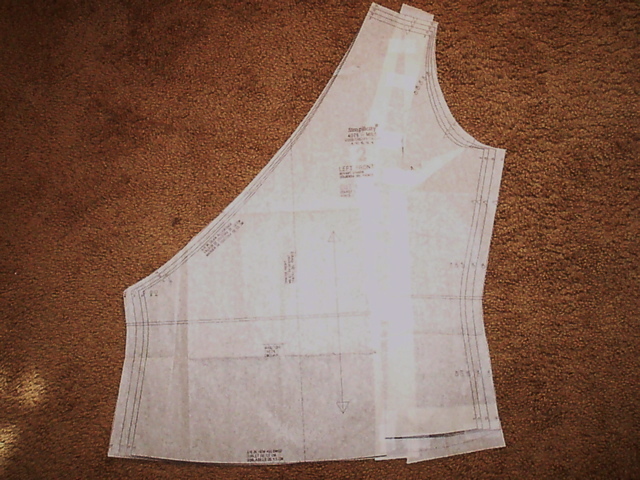 Yippee I can make my shirt I’vew been comtemplating since last summer. THANK YOU! THANK YOU! THANK YOU! THANK YOU! THANK YOU! THANK YOU! THANK YOU! THANK YOU! THANK YOU! THANK YOU! i’m working on my daughter’s wedding dress and have already botched the bodice twice. Having never taken a course on tailoring, I’ve been trying to make adjustments blindly. Your bust and length adjustment tutorials have saved the day! Kisses, kudos, huzzah! I’m so excited to have found your blog-site. It was a huge help to me as I made my daughter’s wedding dress. However, I would desperately like to read the tutorial mentioned (“Sewing Diva Gigi has a great one on her blog.”) and haven’t been able to find it from your link. Would you post the link, or update it? That would mean an awful lot to me! As Pam (#11) mentioned, it doesn’t appear that there is any side dart in the FBA on this pattern. I’d love to be able to make the adjustment without a dart for patterns that call for stretch fabrics, so please let me know if that’s what you did here. Like the people in 11, 17, & 18, I couldn’t find the FBA instructions referred to on the Sewing Diva Gigi site, and the only way I know to do it is the way it’s done in Fit for Real People. Also, by doing FBAs on both sides and then doing this procedure, aren’t you adding twice as much to the bust measurement? Thanks so much for the tutorial, I am all enthusiastic to see if this will solve my fitting trouble. Lots of posts were asking about Gigi’s tutorial (which I can’t find either) and the FBA without darts. I found this site which suddenly made it all clear. Hope this helps.